The UK's National Institute of Health and Clinical Excellence (NICE) has made its entire range of recommendations and advice available to mobile users through a new smartphone app. The cost-effectiveness watchdog's new NICE Guidance app is available for Android and iPhone smartphones and aimed at healthcare professionals, such as doctors, nurses and medical students. It will also serve as a handy reference tool for the pharmaceutical industry, giving pharma personnel easy access to NICE's influential 'technology appraisal' recommendations on NHS use of new drugs. The free app contains more than 760 pieces of NICE guidance, is automatically updated whenever access to the internet is available and, when online, will receive guidance updates as soon as they're published on the NICE website. Guidance is arranged by clinical or public health topic, and particular sections can be bookmarked for easy access, or sent via email. NICE said it's the first ever app to contain public health guidance, including topics such as smoking cessation, behaviour change and diabetes prevention, was developed in response to demand from clinicians and other users of its guidance. Jane Gizbert, communications director at NICE, said: “The app will provide offline access to all of NICE's guidance products, including clinical guidelines, public health guidance, technology appraisals, interventional procedures guidance, medical technology and diagnostics guidance. NICE Pathways was launched in 2011 and put the Institute's guidance into user-friendly online flowcharts based around care pathways to give an at-a-glance view of all NICE's guidance on a specific condition, such as diabetes. NICE began using mobile technology with the 2010 launch of a mobile version of its online clinical evidence portal NHS Evidence, which provides healthcare professionals with their own version of the NHS' public-facing website NHS Choices. 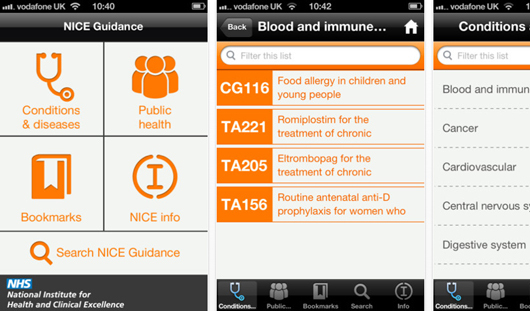 The NICE Guidance app works on Android smartphones, Apple's iPhone and iPod touch devices. It can also be downloaded for the iPad, but it is not currently optimised for it, so NICE suggests iPad users access its Pathways sites instead. The new app may give NICE's guidance a greater reach outside the UK, adding to the efforts of its NICE International arm, which is advising countries like China and Brazil on health technology assessment (HTA). NICE told PMLiVE that although the app's "priority audience" is those within the UK that use its guidance, the app has not been restricted to the UK only and would be available worldwide.